Today I stopped by to see how the house was going. It is going well but glacially slowly, as usual. But hey, the glaciers are speeding up, so maybe my contractor will, too. I live in hope. Or maybe my workers are frozen. Check out this photo. This will be the utility room — coats, boots, muddy dogs, miscellaneous detritus. Every house has or wants one. Right now, this is the worker’s bathroom. Yes, they need the shower. They spend a lot of time here. They need a heater too and no, it’s not just out of the frame. Privacy screen around the toilet? That went during demolition. Even the door is gone so even though they do generate steam in the shower — note the water heater — it doesn’t stick around long enough to get them into their clothes. I would be so cranky but of everyone I deal with on this project, the guys who depend on this room are the cheerful ones. There is a life lesson here but I have no interest in learning it. Good advice. That plus my advance pup, Jacques, racing ahead to see who wants to play with him now, should save us a lot of embarrassment. Is this the only toilet/shower facility at present? I have vague memories of an earlier photo with a pink bathrooom….? Will the water heater be separate from ground source thermal heat pump thingy? Have I totally missed something? Well, yeah, Gill, this house is totally uninhabitable right now. I don’t even have mice. This is indeed as close as the place gets to a bathroom. The toilet was and is the only one in the house. Some day there will be more but for now, you’re looking at it. That pink bathroom? 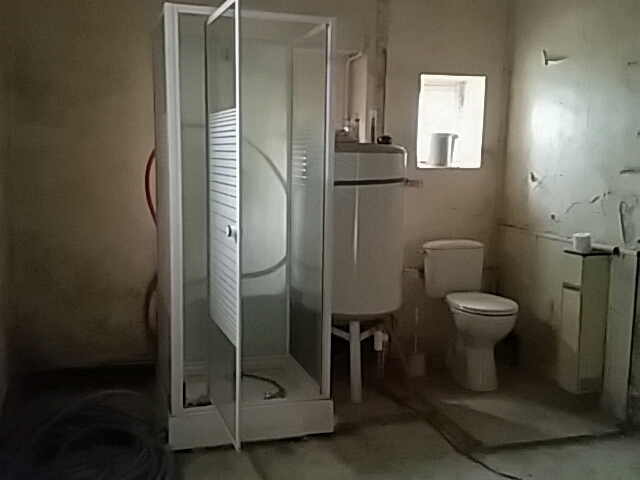 It never had a toilet; we are adding one. All the pink is gone, replaced by shiny silver-lined insulation. When the plumbers get around to putting in the geothermal system — the to-do list between now and then is pretty long — the water heater will be banished to the basement. This is a temporary patched-together system, just to keep the workers going during construction. They put it together themselves, at no charge to me. When the “real” bathrooms go in, they will pull out everything, put in a new WC, new tile and all. I was just struck by the look of it all and the whole idea of using this setup in the freezing weather we have now. With a geothermal system you still need a water heater; what changes is that most of the power to run it is generated from the ground — strictly speaking, in this case, from the ground water. I’m looking forward to a next-gen system, one that needs a little outside push to get started but then powers itself. At least the loo roll is colour coordinated. Why do you never listen to me? Next Post This used to be the pink bathroom.